As we discussed in the “Tools of the Trade: Choosing the Best Floss” post, there are a wide number of choices when it comes to dental floss. Daily flossing is an essential part of a great oral health care regime and is necessary to inhibit the formation of plaque, which leads to tooth decay and gum disease. We will be examining the proper use of dental floss, manual flossers and electric flossers. There are two basic rules that apply to flossing, no matter which tool you choose to utilize. Be gentle. Snapping, forcing or otherwise using excessive force when flossing can damage the delicate gum tissue. Always a back and forth motion when sliding floss between the teeth. Be thorough. Floss in between each tooth, even those in the back. If you have difficulty reaching any area, use an angled flosser (electric or manual). The posterior teeth are especially vulnerable to decay and gum disease as they are the primary chewing teeth and also the most difficult to reach with a toothbrush. Carefully floss around all dental restorations and appliances. Floss threaders allow the floss to be threaded under the main wire. Once the floss is in place, the individual can floss as usual. Flossing around crowns, bridge and implants ensures that the gum tissue in remains healthy. Obtain an 18-inch length of floss. Wind each of the ends of the floss around the two middle fingers, leaving a one- to two- inch section in between. Use your thumbs and a back and forth motion to direct the floss between two teeth. Use index finger to wrap the floss around the surface of the first tooth and guide it in a back and forth motion up and down the tooth surface. 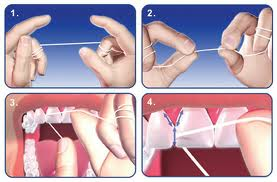 Repeat the same step, wrapping the floss around the second tooth. Use a back and forth motion to remove the floss from in between the two teeth, do not snap the floss. Move to a new section of floss and repeat the same steps on each tooth until all teeth have been flossed. The same technique as described above should be used with both manual and electric flossers. It is easier to damage gum tissue when using one of these devices so it is especially important to ensure the utilization of good technique and a gentle hand. Dental hygienists are trained to aid in the education of patients. If you have difficulty flossing your teeth or are unsure about how to floss around dental appliances or restorations, seek the counsel of your hygienist.